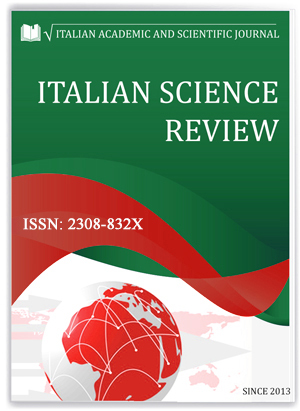 The journal (digest) is titled “Italian Science Review". ISSN: 2308-832X. Digest indexed in Google Scholar. The purpose of the journal is to promote and enable international communication between scientists living in different countries of the world. The journal offers an online platform for a rapid publication of scientific papers of all kinds in the following disciplines: Pedagogy, Economy, Management, Marketing, Psychology, Sociology, Law, Philosophy, Medicine, Physics & Mathematics, Biology & Ecology, Engineering & Technologies, History, Archaeology, Cultural Studies, Geography & Earth Studies, Politics, Legal Studies & Law, and Chemistry. The scope of the journal is broad enough to attract a reader with a professional background as diverse as law, biology, geography, genetics, art history, history, marketing, management, medicine, philosophy, and politics. Our journal is read by undergraduates, master and PhD students, businessmen, teachers, and professors alike.